Dr. Todd Goldensoph was born in Peoria, IL and moved to Davenport, IA at a young age. He attended Davenport North High School. 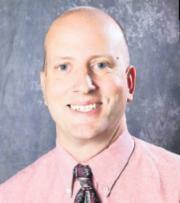 In 1995 he graduated from Northeast Missouri State University (now Truman State)with a Bachelor of Arts in Biology. He received his degree Doctor of Dental Surgery at the University of Iowa in 1999. After Dental School, he worked in Saginaw at a private practice as an independent contractor for 12 years. In 2011 he opened his own practice that is unique to his own dental style, dedicating himself to patient care and satisfaction. While not in the office, Todd is most often found at a sporting event supporting one of his 4 boys. He enjoys hunting, fishing, reading, and coaching youth baseball. Todd is an active member of First United Methodist Church and devotes a great deal of time and resources to support the Saginaw community.